Whether you own guns for hunting, personal protection, or both, the safety of your guns when they are not in use is a key concern. Every responsible gun owner accepts the fact that the best way to keep both the gun and the people around it safe is to keep it secure by putting it in a lockable container designed specifically for this purpose. Just tossing it into a desk or nightstand drawer isn’t good enough. Far too many accidents have been caused by that kind of careless action. Storing your firearm in the best gun safe available isn’t only a good safety practice, it’s also good for the gun. Modern safes are affordable, provide a perfect storage environment, secure your weapon from unwanted access, and as an added bonus, they look cool! With all of that in mind, Stuffoholics has scoured the marketplace to help you find the best gun safe for the money, no matter what your budget might be. On our list, you will find the best gun safe for whatever your needs might be. Whether you need a safe for home, apartment, car, long guns or pistols, we have the answer. The key thing to know is that we are not promoting any particular brand or style of gun safes in our reviews. Our research is done on a strictly independent basis. That’s how we test everything we report on, and our audience over the past four years has come to trust us for exactly that reason. Our only goal is to help you gain the knowledge and insight you need to make an informed decision when you go shopping for a top rated gun safe. To develop our gun safe reviews we have we have tested nearly 20 gun safes. We spent about 70 hours of web research, pouring over all the information we could find about these safes. Then we spent about a week testing the best safes. We also examined the community-based usage of gun safes and poured through online reviews for insight from real-world owners. The result of all of that research is what we have used to arrive at our top ten list for the best gun safe. The list includes safes that offer a wide range of options and features. From here, it is up to you to decide which safe best meets your needs. Why should you need a gun safe? The short answer is that if you own a gun, you need a safe. For one thing, the safety of children and other people who come into your home depends upon you being a responsible gun owner who makes sure the firearms are secure from untrained and unauthorized handling. In fact, in many states, this is a legal requirement. Another reason to keep your weapon in a top rated gun safe is to protect it from theft. As a gun owner, the last thing you want is for your gun to be stolen and used in a crime. Having your gun secured is cheap insurance against the enormous legal challenges you would face if this happened. Beyond the safety issue, having your firearms in a lockable cabinet designed specifically for them means they will always be maintained in the best condition possible, and ready to use when you might need them. Many safes are fireproof and waterproof, designed as much to protect the guns from outside forces as much as anything else. A safe is a cheap protection for your firearms, no matter which way you look at it. How does a gun safe work? A gun safe isn’t much different than any other type of safe. In fact, many gun safes are large enough that you can actually use them to store jewelry, money, and other valuables along with your guns. Some can be mounted to a wall or in a closet, but the manner in which gun safes are locked and unlocked does vary from standard safes in several ways. Many gun safes forgo the traditional numerical dial mechanism for unlocking the safe in favor of high tech methods like fingerprint and other biometric identifiers, or they use keypads for entering a digital code. There are two main reasons for this. First is that only those who are pre-authorized to open the safe can do so. The second reason is that these methods allow for fast access. If a gun is used for personal protection, a safe that takes 30 seconds to open may not allow fast enough retrieval of the firearm. There are as many different types of gun safes as there are guns. One of the most popular is the biometric style, which requires the authorized user to put their finger on a scanner that reads their fingerprints. If you’re not a match, the safe won’t open. 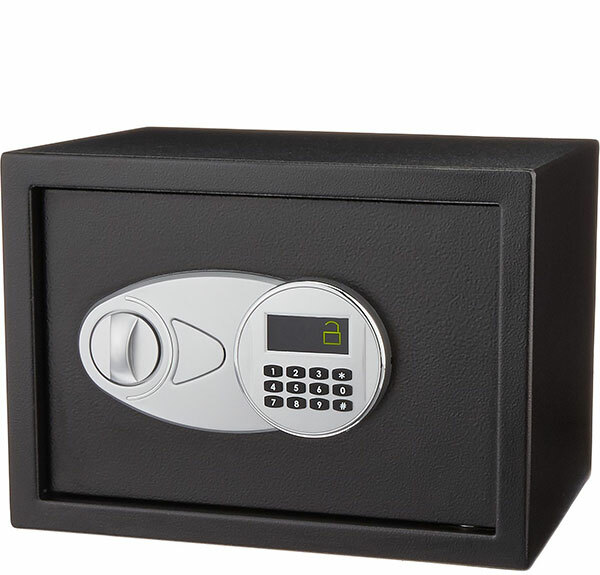 Although there are wheel and pin combination lock safes, modern gun safes tend to favor the digital keypad design. Some gun safes have a traditional key, which comes with all of the obvious perils of losing that key. A variation on that are safes that require you to use an RFID keycard or key fob – and even a smartphone app – to trigger the unlocking mechanism. There are even some safes that can be programmed to require you to use two of these forms of entry to open the safe door. 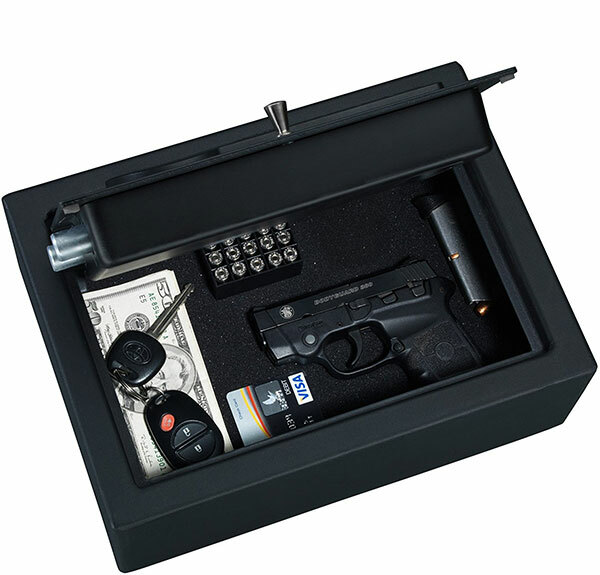 Gun safes come in a variety of basic designs as well. Some are hidden gun safes under a bed, in a nightstand or closet, or even in a wall behind that picture of Aunt Rosie. 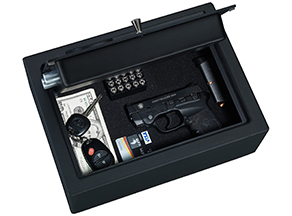 There are also portable safes for traveling with your firearm, and others are designed to be mounted in your car. What to Look for in a Good Gun Safe? I’ve talked a lot about the unlocking mechanism, and there’s a reason for that. It’s a fair assumption that every entry on our best gun safe top ten list is well made. But the style of lock that suits me may not be something you like. So, how you gain access to your safe is a critical consideration. Consider the capacity of the safe. If you have one handgun for personal protection, you don’t need a vault capable of holding 15 long guns. You might choose a single gun safe that mounts under your desk. This is, at the heart of the matter, a safe. Therefore, it needs to have many of the same qualities we have come to expect from a safe of any sort. The walls need to be thick and impenetrable. The locking mechanism needs to be sturdy and foolproof. A good safe should offer great protection against fire damage to the contents. And it should be designed to be firmly mounted to floors, walls, or other immovable structures. Finally, make an overall assessment of the quality of the gun safe. If it seems like the manufacturer decided to go cheap on some components, it’s a good bet they also went cheap on things you can’t see. There are high-quality yet affordable gun safes on the market, so skip over the ones that don’t meet your standards. Who Are Gun Safes For? You are thinking the answer to that question is that gun safes are for every person who owns a firearm. That’s only partially true. Yes, a safe is used by its owner to store guns in a stable environment where they will be secure and protected from theft. But that’s only part of the story. In reality, the gun safe exists to protect the people who are not gun owners. The safe keeps the firearms securely out of the hands of unauthorized users. Far too many crimes are committed by assailants who stole their guns from law-abiding citizens. And far too many gun accidents have occurred when untrained people and children have handled firearms in unsafe ways. By making sure that your guns are locked up in the best gun safe you can buy you protect yourself, your guns, and everyone around you. It is simply the responsible way to store your guns and ammunition. That doesn’t just apply to life at home, either. Any time you take your gun with you on the road, you should consider a portable gun safe for the same reasons. A firearm is more likely to be stolen from you when you are away from home with it. Obviously, if you own hunting rifles and shotguns, you are in the market for a long gun safe. They are larger and have room for storage of long guns, ammunition, and any other articles you want to keep locked away. Since these safes are often designed to be fireproof, it’s worth considering storing important paperwork and other irreplaceable items in there as well. If you have enough items you want to keep safely locked away, you might consider a long gun safe or gun cabinet, even if you only have a pistol or two. Pistol safes can be as small as to only allow storage for one gun, or they may be capable of holding several pistols and ammunition. Stuffoholics recommends that, unless you are looking for a specific design, like a nightstand safe for example, you should consider purchasing a pistol safe larger than you think you need. You might acquire another pistol or find a few other items you want to stow in it. In the four years we have been reporting and testing products for this website, Stuffoholilcs has examined about twenty gun safes and tested most of them. This testing has included practical data from volunteers as well. While this is a list of the best gun safe offerings we have found, none of them are perfect. We have found things we like and things we don’t like about every one of them. Still, we believe these are the best. We spent two months monitoring community-based usage of these gun safes and analyzed their performance and operation. We factored in their weight, size, appearance, manufacturing quality, adjustable features, and many other details. After all of that study and research, we are confident that this list of gun safe reviews represents the highest rated safes for the money. Stuffoholics has analyzed 42 of what we consider to be the most important features available on gun safes on the market today. To help us compare these features, we created a research data spreadsheet and developed our top ten list based on that data. In the interest of absolute transparency, and to help you make your own decisions, we offer this raw analysis data directly to you. The spreadsheet is linked below, so you can go right to the data and see for yourself which is the best gun safe for the money that you want to spend. We have prepared this list solely in the interest of providing you with the straight facts and most in-depth information available to help you choose the gun safe that is right for you. This safe features silent, one-handed entry using quick and secure biometrics. It stores up to four fingerprints so you are always in control of who has access. For easy access without compromising on security. We have analyzed 42 of the most important features found on highly rated gun safes as a method for comparison. 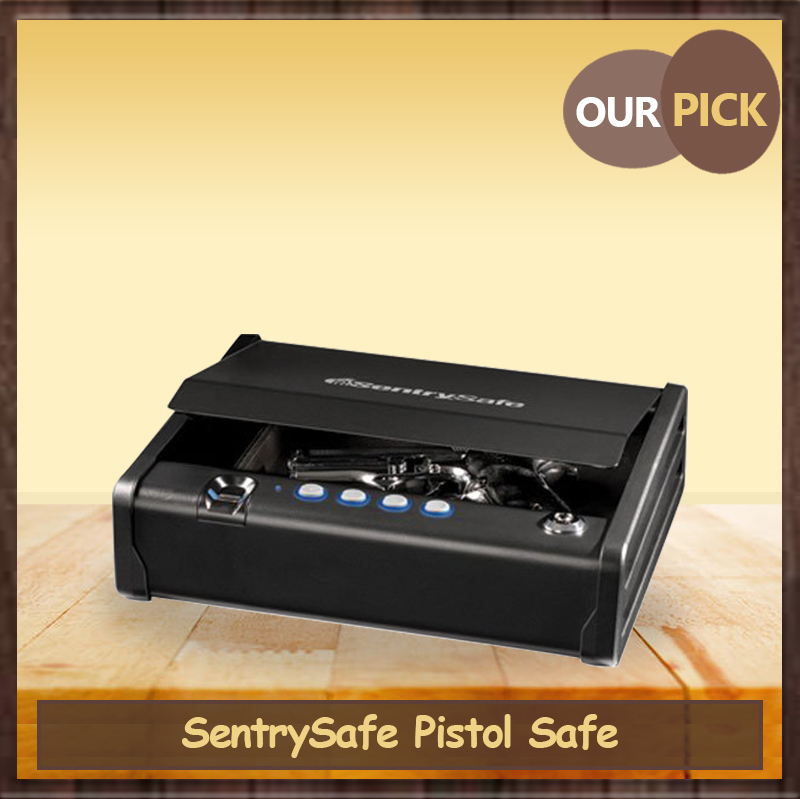 Although this pistol safe from SentrySafe doesn’t have the highest number of features on our list, it does have a unique combination of 12 of the most effective features, which lands it at the top of our reviews. This safe is a portable unit with capacity for a single handgun. It has three ways of being opened by the right person. There is a biometric fingerprint scanner, a four button keypad, and a keyed locking mechanism as well. The soft interior lining helps protect the gun’s finish. The safe has a quick, quiet entry system that incorporates a compressed gas strut so opening the door is whisper-quiet and then the strut holds it wide open for easy access with a single hand. With all of these great features, this unit comes with a sale price of only about $150 dollars, so it is very affordable. One of the methods we use to judge the response to a product is by comparing the frequency of positive online reviews a product gets at Amazon. Reviews that come in at a higher number and a faster rate indicate that a product is both very popular with buyers, and well received, too. We sample 30 ratings during our study. This safe received it’s first ten positive ratings in just 15 days. The second ten great reviews occurred in just 6 days and the third set of ten in 9 days. Our research shows that this safe has a door that strongly resists prying efforts and solid steel construction that provides strength and security. 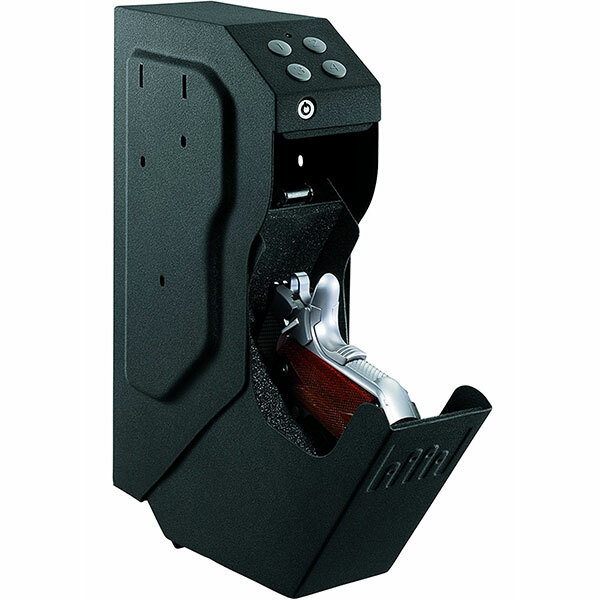 Its ability to resist unauthorized access to the firearm inside makes it unique among all of the other safes on our list. 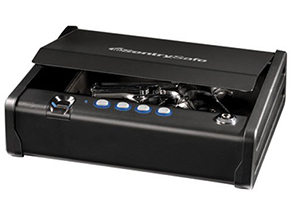 The SentrySafe pistol safe, Model QAP1BE is designed for secure storage of a single pistol. It is large enough that a small box of ammunition will also fit in alongside most handguns. But it is also small enough that it will fit inside a nightstand drawer or take a ride with you in the car to a firing range. The exterior dimensions are 6.6×9.7×2.2 inches and it weighs 12 pounds. Construction is all 12 gauge solid steel with a pry-resistant door. The security system is powered by 4 AA batteries.This gun safe is not fireproof. This safe is designed for fast single-hand entry. The interior padding is a soft premium foam to keep your gun protected from scratches and damage. The pry resistant door is supported by a compressed gas strut that silently glides the door open and then holds it there. This safe’s primary method of entry is by way of biometric fingerprint technology. It will hold up to four fingerprints. That means you can record four of your own fingerprints, or two from you and two from another person, or one from four different people. A secondary opening method is with the four button keypad that also provides for silent entry. Thirdly, there is an override key lock for a backup access method. The biometric pad requires you to put your finger in place for a moment and then swipe it off. Having the keypad and key as alternate entry methods gives you the ultimate choice of access options. The compressed gas strut that silently pushes the door open and then holds it open makes single-handed access to the gun as smooth as can be. This safe does not come with a cable for attaching it to an immovable object. But it does have pre-drilled holes to allow for firm attachment to a surface. Some reviews report finicky biometric readers. This single gun safe from SentrySafe takes the top spot in our survey because it is about as handy a safe as you are going to find. The biometric pad is quick and easy to use. The four button keypad provides a fast alternative method for gaining entry. Thanks to the gas strut that controls the door movements, retrieving the pistol is an easy and fast one-handed task. Best of all, whether using the biometrics or the digital keypad, access is absolutely silent. 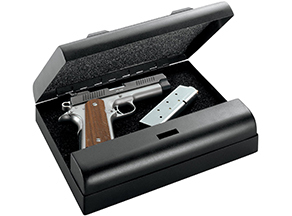 This is an affordable and portable gun safe that can also be firmly mounted in place. The solid steel construction means your gun will be safe and secure, and ready when you need it. Low-cost but high-security. This safe is best for those who are on a budget. With powerful locking bolts, you will never have to worry about compromising on safety to get an incredible deal. With a sale price of only about $40 dollars, this is the most affordable safe on our list. But despite this budget-friendly posture, this safe still has 11 of our most favorite features. For one thing, it is small enough to fit inside a desk or nightstand drawer. The solid steel box features concealed hinges and 2 live action bolts to securely keep the pry-resistant door locked. Our comparison of customer rating frequency shows this unit is gathering happy owners at a very good rate. It received its first ten positive ratings in 23 days, second ten ratings in 14 days and the third ten in just 17 days. A couple of special features really caught our eye with this safe. It has a low battery warning system that lets you know when the batteries need to be changed. 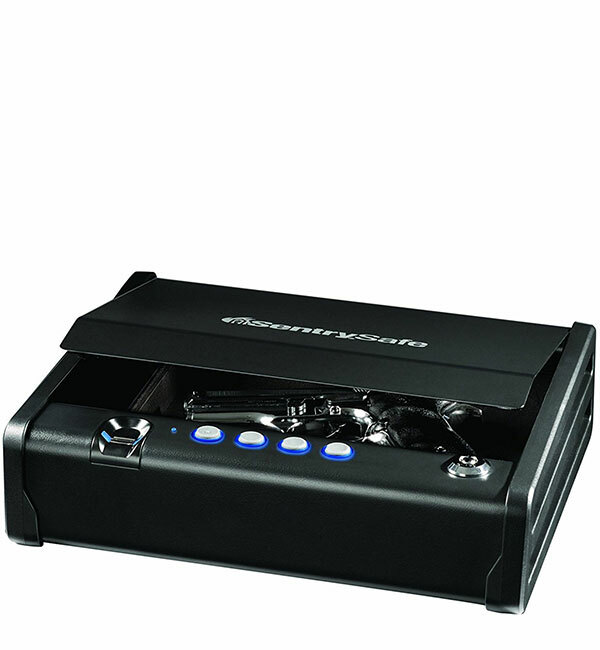 It comes with two backup keys and also mounting hardware that is absent from most other safes. 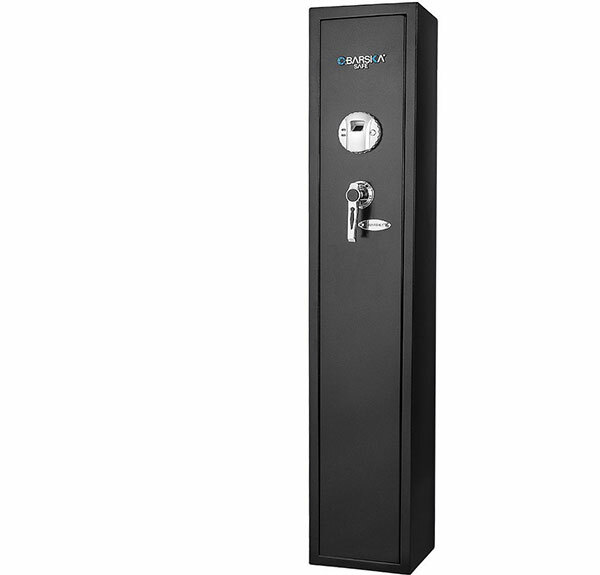 This combination of features wrapped into a safe that has the lowest price on our list easily makes this safe from Stack-On our money saving Budget Pick. The body of this gun safe is all steel construction with a pry-resistant steel plate door and hidden hinges. It measures 12×8.8×4.5 inches, making it large enough to hold a pistol as well as several other important items. It has pre-drilled mounting holes for securing the safe to a floor, wall, or inside of a drawer or closet. Mounting hardware is included with the safe. The security system requires 4 AA batteries. The digital keypad is easily programmable for changing the combination. It also comes with 2 backup keys that can be used to open the safe in lieu of the keypad. The door is securely locked in place by two hefty live-action bolts. The digital electronic locking mechanism can be easily programmed by the user. It emits beeps when the keys are depressed, but this can also be turned off for silent operation. However, opening the safe requires you to turn a large knob that is definitely not silent. The lock will resort to a time-out period after three incorrect attempts to enter the correct code. This is a great method to prevent unwanted entry from someone trying to guess the correct code. One thing we want to point out is that the keypad uses rubber buttons, which reviewers report show wear over time. If you never change your passcode, this means someone may be able to figure it out by studying the wear patterns on the keys. The remedy is to regularly change your code. The included mounting hardware makes it easy to secure this safe inside your home or apartment. It’s hard to believe this little gem of a safe is so cheap. For around $40 bucks you can securely mount this safe right where you want it. The sturdy locking mechanism and steel plate door provide a level of security you wouldn’t expect from such an affordable safe. It’s not the best safe on our list, but for the money, it is certainly worth considering. 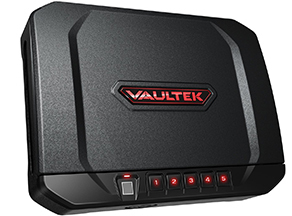 Simply download the Vaultek™ Smart App to have highly customisable control over your safe. The app will allow you to track safe usage, control access, and lock your safe remotely, all from the palm of your hand. As you will see on our attached research report, this biometric handgun safe is equipped with the highest number of positive features of any gun safe in our survey. At around $255, this safe is one of the higher priced pistol safes we studied. But the money buys you a lot of high-end features like anti-pry bars, anti-impact latches, internal hinges, and interior security brackets for the best break-in protection you will find. Thanks to the biometric entry system, backlit keypad, and automatic opening door, you can gain quick, quiet access to your firearm when you need it most. Online reviews agree. When comparing actual Amazon customer ratings, we found this safe received its first ten positive ratings in just 16 days, the second ten in 9 days and the third ten in just 11 days. That adds up to a lot of happy customers. 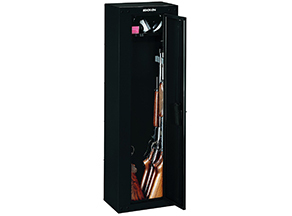 This gun safe is made from 16 gauge steel that is powder-coated for a finish just as tough as the box itself. Exterior dimensions are 11.5x9x2.75 inches. That’s large enough for almost any pistol and ammunition. This safe can be used as a portable carrying case in your car, or securely mounted in a permanent location. Anti-pry bars and internal hinges make this safe very secure from brute force attacks. The security system is powered by a rechargeable lithium-ion battery that keeps it powered for months at a time between charges. This gun safe is not fireproof. There is a Vaukltek® Smart App that you can download to your phone that allows you to track safe usage, toggle the sounds on and off, adjust the interior lighting, view the battery status, and even unlock the safe if the phone is within a set range. While that sounds terrific, and it is, Stuffoholics does worry about the potential for this system being hacked. An earlier version of the software was easily hackable in mere seconds using a laptop and a simple script. However, Vaultek says the issue has been corrected. Still, no technology like this is invulnerable. It is possible to turn the Bluetooth connection system off and we recommend doing so for most applications. There is an internal LED light that can be adjusted from a very bright setting, all the way down to off. The biometric scanner includes a high-resolution scanner and can hold up to 20 fingerprints. The keypad has a very handy proximity sensor that triggers the backlights in the keys. There are more than 40,000 possible combinations and some hotkey shortcuts as well. The keys emit beeps that can also be turned off for more silent operation. The locking mechanism, however, is not silent when it pops open. This gun safe meets TSA airline firearm requirements. The lithium-ion battery is a major plus. It will hold a charge for months and can be recharged in about 2.5 hours. The Smart App does provide some very advanced controls of this safe, the hacking potential notwithstanding. 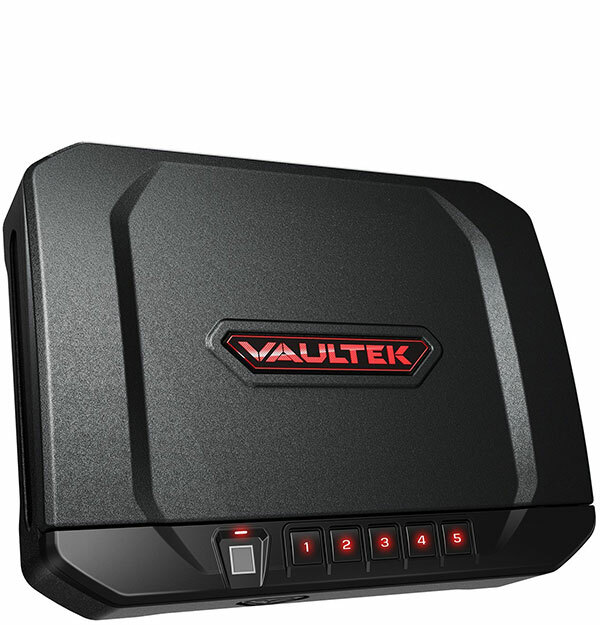 Vaultek includes the battery charger and USB cable for recharging the lithium-ion battery. It does not have to be removed from the vault for charging. In fact, it is possible to leave this unit plugged in all the time if you intend to mount it in a secure location. Mounting hardware is included, as is a four-foot-long 5MM diameter steel security cable. Also included are two manual keys. 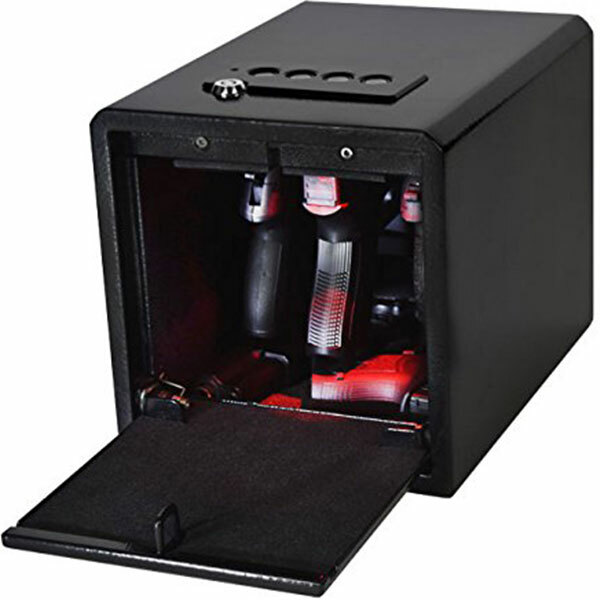 This is a very advanced gun safe that can be permanently mounted or used as a portable unit. The advanced biometrics system with proximity-sensors backlit keypad is made for quick and easy entry. The Smart App provides an extra level of control. The strength and security provided by this safe are outstanding. You will pay a lot for this safe, but this is truly a case of getting what you pay for. The easy to use design & unique “No-Eyes” keypad, makes this safe both secure & simple for beginners. Finger grooves on the keypad means you don’t even need to look at the keypad to get fast access to your firearms. This is an easy to use, lightweight gun safe that is ideal for transporting your gun in the car or permanently mounting in your home or apartment. At only 4 pounds, it is a very lightweight safe, but that doesn’t mean it isn’t secure. The patented “No-Eyes” digital keypad allows for secure access, even in the dark. With a sale price of around $86 dollars, it is a cheap investment that provides a high level of security. It is a perfect entry-level safe for beginners. This pistol safe is made from 20 gauge steel and weighs four pounds. Exterior dimensions are 11×8.5×2.2 inches. The security system is powered by a nine-volt battery. The interior is lined with soft-foam. The steel door is designed to prevent brute force tampering. The “No-Eyes” keypad is a unique design. It has four buttons laid out with finger grooves around them. This allows you to place your hand squarely over the buttons and know which one you are pushing without even looking at the keypad. There is a low battery warning light. Pay close attention to it because owner reviews point out that this unit does not function when the batteries begin to get low. They report that when the batteries begin to lose power, the safe lock sounds like it is opening, but doesn’t actually allow access. Maintaining well-charged batteries is a must. The four-button digital keypad allows for more than 12-million different combinations. The beeps generated by keypad depressions can be turned off with a switch. There is a warning light that comes on if an entry has been attempted by an unauthorized user. An override key is also provided. The safe comes with a 4-foot long high-strength steel security cable for attaching this safe to an immovable object in your home or apartment. This pistol safe also comes with a five-year warranty. The MV-500 from Gunvault is a no-frills design with the singular goal of providing safe and secure storage for a single handgun and some ammunition. It is lightweight and portable, so it makes a great carry-case. The ability to find and depress the correct keys without even looking is an excellent concept for use in low-light situations. A number of users complain about battery life and note that the battery doesn’t have to fall too far from a full charge before they encounter problems unlocking the safe. There is a low battery warning light inside the unit, so keep a close eye on it, replace the battery when it warns you to do so, and you should have no problem. Otherwise, you have to take other measures to break the safe without the combination. Why is this product Best for Long Guns? If your collection is starting to take over your storage space, this security cabinet could be the answer. With room for up to eight long guns, your collection can be safe and available in one convenient location. A quick look at our research report will tell you that this is a most useful long gun storage cabinet at an amazingly low price. The cabinet holds up to 8 rifles and shotguns up to 52 inches in length. This full-sized welded steel cabinet is manufactured in Illinois. The all-steel cabinet actually locks in 3 places around the door and has a double-bitted key. The full-length steel piano hinge provides great security for the door. This is a ready-to-assemble unit, so be prepared to wield some tools. The 18 gauge steel panels are held together by fasteners that cannot be tampered with from the outside. The door is mounted with a piano-style hinge that runs the full length and is welded in place. The unit weighs just over 50 pounds and the outer dimensions are 17x11x53 inches. 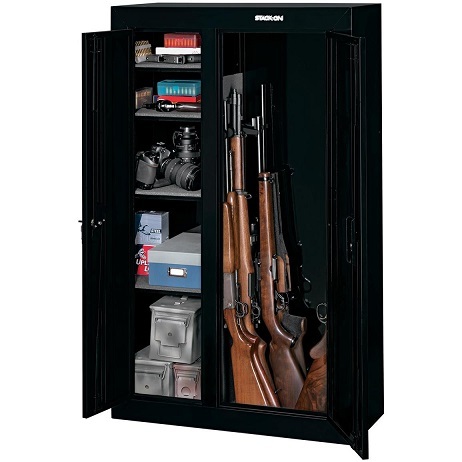 The biggest convenience this gun cabinet offers is low price. For about $80 dollars you can have safe storage for up to eight long guns. Stack-On calls this unit a gun “cabinet” as opposed to a gun safe. We agree. The keyed entry system is quite basic. However, the door does have a very secure three-point locking design. In other words, there is a lock pin that slides into place at both the top and bottom ends of the door, as well as a slide that engages at the center of the door. No one is going to pry open a corner of this door. The entire cabinet, however, would likely succumb to a brute force attack with a crowbar or similar device. Since the walls are held together by small fasteners a forceful, albeit noisy, attack would likely succeed in gaining entry. The foam padded bottom and barrel rests help keep your guns from getting scratched or damaged. The barrel rest also includes a patented barrel stand-off rest for scoped guns. There are predrilled holes for securely mounting this cabinet to the floor or wall. Mounting hardware is included. Can (and should) be mounted to the wall or floor. This is a perfectly fine cabinet for storage of long guns, as long as your primary concern is keeping them out of the hands of young children and casual visitors. The lockable door will keep curious people out. But it is not like a gun safe. An intruder bent on breaking into it will likely succeed. Perhaps locating it in a closet or other discreet spaces is a good idea. Also, be aware that this cabinet needs to be assembled. The door of this safe is set deep into the front panel making it highly pry-resistant. Great for those who are looking for a no-frills storage solution that still offers top tier security. This is a heavy-duty basic safe capable of being used for many functions. Certainly, the safekeeping of firearms is well within its range. Several handguns and their ammunition would find a cozy home inside this vault. It features steel construction, 2 heavy duty live-door bolts and pry-resistant hidden hinges. This safe has an all steel exterior shell and door. The entire locking mechanism is mounted on the interior side of the door, making it about two inches thick. The exterior measurements of the safe are 13.8×9.8×9.8 inches. It weighs a hefty 16.5 pounds, so you know it’s built with lots of steel. The keypad and locking mechanism are powered by 4 AA batteries. Although it is not listed as being fireproof, Stuffoholics has seen this safe pulled from a fire with the contents intact. The floor is carpeted. There is also a shelf, but it is not padded. This is a basic use type safe, so there are no special accommodations for the storing of handguns. However, with a little creativity, this safe could easily be retro-fitted with a low-cost handgun rack. The electronic lock uses a digital keypad system for entry. The passcode is programmable by the user. There are also two override keys that allow access if you forget your code. The entire door is sunk into the front of the panel, making it very pry-resistant. The hinges and bolts are all on the inside. The interior shelf is adjustable and even removable to accommodate larger items. This safe is really designed to be bolted to a wall, shelf, or floor. It has four pre-drilled holes in the back and on the bottom and comes with the proper hardware for secure mounting. This is exactly the type of safe you find in the closet of many hotel rooms. It is a very popular design. It is easily programmable, simple to use, and quite secure. Best of all, it is very affordable. At just over $50 bucks, you’re going to feel like you just stole the safe! It is not purpose-designed for handguns, so if this is your intended use, you might want to think about adding some padding, rails, or other devices to provide better care for your guns than just tossing them in on a bare metal shelf. All the security of a safe with the convenience of a holster. With convenient gun grip-first presentation you can be armed & ready to go at the touch of the keypad. Now you really can be prepared for anything. Think of this handgun safe as more of a holster that gets mounted to the underside of your desk, store counter or nightstand. Enter your keycode using the four buttons and the safe is designed to drop open, presenting your gun grip-first, exactly as a holster does. The Speedvault is made of 18 gauge steel and is designed specifically to be mounted on either side or the back. The dimensions are 6.5×3.5×13 inches. The locking mechanism and digital keypad are powered by a 9-volt battery. The interior of this safe really is a foam padded holster. The barrel of your handgun slides snugly and securely down a cutout in the foam padding and the entire firearm is just suspended by the foam. It’s very easy to enter the code, allow the door to quickly pop open, and wrap your hands around the grip. This safe utilizes a four button keypad, which is at the top of the unit. If you have this mounted under a desk, for example, it is very easy to key the code, release the door and grip your gun without ever looking down. There is an override key as well. When the safe opens, an interior LED light comes on, allowing you to see in the safe under low light conditions. GunVault provides a five-year warranty for fire and burglary. This gun safe is a purpose-designed unit whose sole function is to have a handgun at the ready behind a counter or under a desk. For a use of that nature, this safe is perfect. At about $100 dollars, it’s also a good deal. But if you need to transport your handgun or want to store some extra ammunition with it, this safe isn’t for you. Store up to three handguns in this simple but effective safe. Guns are stored at the ready on rod-hangers. 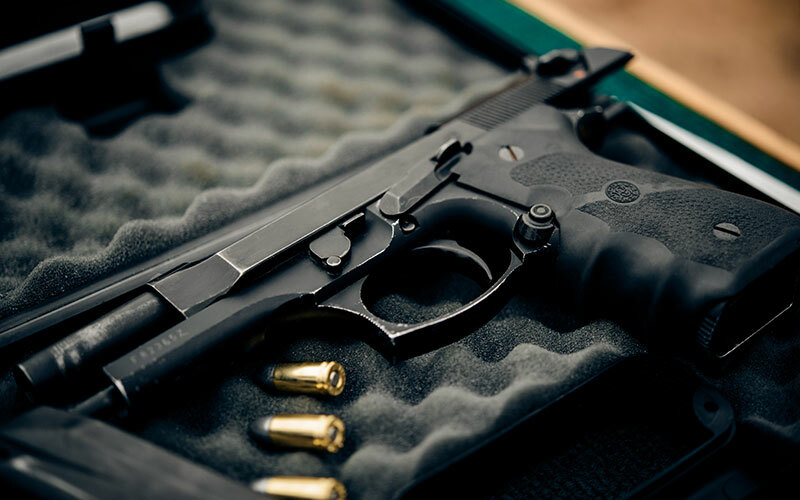 Have peace of mind knowing that your handguns are ready to go as soon as you are. This is a truly purpose-designed handgun safe capable of holding as many as five guns and a couple of extra clips. The real beauty is that three of those guns are hung on rods so that when the door drops down, they are presented at the ready, just the way you want them. The tactical design of this hanger system is sure to please. This safe is constructed of solid steel and has anti-pry tabs and a recessed door to resist any brute force attack. External dimensions are 9x9x12 inches and it weighs 15 pounds. The spring-loaded door is a drop-down design that is so heavy and so fast when it opens, that it is equipped with a speed reducer that stops its descent just before it slams open, and gently eases it down for a quiet landing. The electronics are powered by a 9-volt battery. The rod hangers for three handguns are a fabulous way to store them at the ready. The rods are coated with a soft shrink-wrapped plastic that won’t damage the barrels of your guns. If you have an accessory like a rail-mounted tac light, you may find the stopper won’t allow your gun to fit. However, unbolting the rod and flipping it upside down will give your gun the clearance it needs. It’s a simple fix. 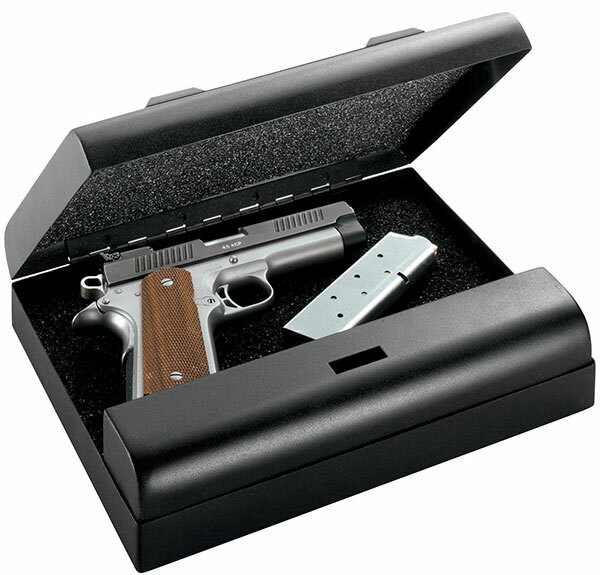 The floor of the safe provides storage for two more handguns and the entire interior is covered with high-density foam. There is also a red LED light that comes on inside the safe when it is opened. This allows you to see your firearms in a darkened room without providing a bright night vision reducing light. A small shelf provides space for another clip or two, depending on size. The electronic keypad has rim lights on the buttons and stores a programmable 6 digit code. The process does emit beeps but can also be set to a stealth mode. This safe comes with a theft-proofing steel cable and has holes drilled through the bottom, designed to allow the safe to be bolted to a shelf or floor. If you are a handgun enthusiast, this safe deserves a very serious look. To be able to store 5 handguns, with three of them at the ready, in such a small yet very impenetrable safe is exactly what you might be looking for. With ample storage space and adjustable shelves, you can store your firearms exactly as you choose with this customisable cabinet. The perfect accompaniment to your long gun storage or great to use alone. The Stack-On Steel Pistol/Ammo cabinet is capable of holding a couple of handguns and much more. With three shelves, the storage options this unit presents give you a lot of options. This welded steel lockbox from Stack-On measures 21x10x18 inches and weighs nearly 25 pounds. The door is set on a full length internal welded steel piano hinge. The locking mechanism is purely mechanical, so there are no batteries required. This cabinet comes with a one-year warranty. This Pistol/Ammo cabinet has two removable shelves. The floor of the unit is foam padded. This is a lockable cabinet with double-bitted keying. There is a locking mechanism that passes through the door and is secured behind the framework. This cabinet is designed to be attached to a wall or inside a closet. The hole alignment is also designed to be mounted securely on top of Stack-On’s long gun cabinets, turning two cabinets into one. This would be a perfect storage depot for all of your long-gun ammunition and still have room for a couple of pistols as well. By itself, this gun cabinet isn’t much to write home about. But when you realize that it is really designed as an add-on to their long gun cabinet (#5 on our best gun safe list), you suddenly have a fairly formidable combination. Between the two pieces, you could safely store 8 long guns, several handguns, and more than enough ammunition for all of them. It’s a nifty concept. Here’s the problem. These cabinets aren’t true safes. They don’t have the advanced biometric locking systems and heavy-duty pry-resistant design of the other safes on our list. They are a great storage solution, but as a safe, well, not so much. High tech-biometrics store up to 120 different fingerprint patterns, meaning you can access this safe with ease from any angle. Never get caught out by awkward finger placement again. Barska brings high-tech biometrics and real security to long gun storage with this safe. 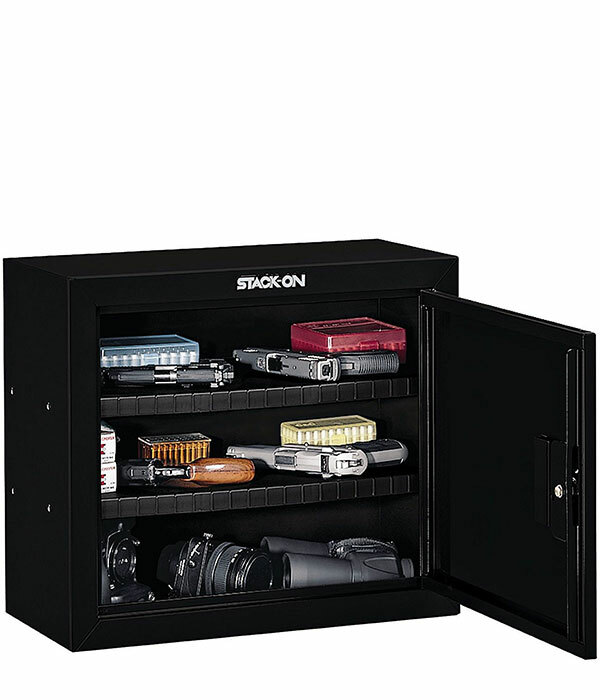 It is packed with a high number of great features that will give you the combination of secure storage and quick access that you need from a gun safe. This long gun safe is built with steel walls and tamper-resistant inner edges. The locking mechanism employs three steel deadbolts that extend 3/4” into the frame when closed. Outer dimensions are 9.7×7.63×52 inches. It weighs 62 pounds. The electronics are powered by 4 AA batteries. Barska says this cabinet holds four rifles. Stuffoholics doesn’t quite agree. Yes, you may be able to find four that will fit in this safe, but we think three average long guns is really all that fit. There is also a shelf inside the unit that allows for ammunition storage. The biometrics system on this gun case is quite impressive. First, it claims access in 2.5 seconds. Also, it can store up to 120 fingerprints. Now, obviously, you don’t want to give access to your gun safe to 120 people. But, here’s why that’s important. You can store your fingerprints from many different angles (high, low, either side, alternate fingers, etc.) so that in an emergency, you don’t have to make sure that you have the exact finger being scanned in exactly the same direction as the peaceful Saturday afternoon when you recorded your prints. The 120-scan storage isn’t an overkill, it’s access insurance. Barska even gives you an emergency battery pack that you can plug in from the outside of the safe if the internal batteries conk out. There is also a backup key access available under the nameplate. This safe from Barska has six pre-drilled mounting points to be easily mounted to a closet wall in your home or apartment. Stuffoholics strongly recommends you do this. This safe has a small enough footprint that if you don’t mount it firmly to the wall, it could easily become a tipping hazard. It’s also small enough that a couple of determined thieves would be able to make off with it. This is a high-quality gun safe for two or three long guns and some ammo. Don’t expect to get much more than that in it. The locking mechanism and biometrics are top-notch. If the size fits your needs, don’t hesitate to check this unit out further. For long gun storage, we think it’s pretty cool. One last comment. At about $275, it’s the most expensive gun safe on our top ten list. Still, we think it delivers good value for the money. Unless your gun safe is of the portable variety, Stuffoholics recommends always anchoring a safe firmly to a wall or floor. Safes, especially tall and thin long gun safes, can tip over. They can also be stolen. Another thing to consider is where you are going to put your safe. There is more than just security to consider. For example, a garage may be too humid, too hot or too cool. That won’t be good for your gun-safes or guns. In terms of maintenance, be sure to read the owner’s manual that comes with your particular safe. In general, any moving part needs to be kept clean and, most likely, wiped down with a lubricant once a month or so. Also, a simple wipe-down of the exterior surface should keep your safe looking like new for years to come. If your unit’s security system is battery-powered, be sure to keep it supplied with reasonably fresh batteries. In studying online reviews of the top-rated gun safes, a common gripe was that the biometrics failed because the user hadn’t changed the batteries often enough. Owning a gun safe for hunters and other gun enthusiasts, especially for parents isn’t an optional purchase. It’s flat-out necessary as well as following proper gun storage and usage practices. Factor this into your thinking when you go to purchase your guns, and expense of the gun safe won’t really seem like an added cost. You want to make sure that the safe you buy meets your needs and provides the security your firearms require. But, as you have seen in our top ten best gun safe list, more money doesn’t always mean a better safe. The real trick is to find the best gun safe for the money. Study our top ten best gun safe list, then dive into our attached research files and you’ll find the answer that’s right for you.